The Department of French has held a conference to celebrate and recognise Prof. Atta Gyamfi Britwum’s contributions to the Department, UCC and Ghana. The three-day conference which was in honour of the astute Professor was on the theme “Literature and the Humanities in the 21st Century: Interdisciplinary Perspectives - (La Littérature et les Science Humaines au xxie siècle: Perspective Interdisciplinaires)”. 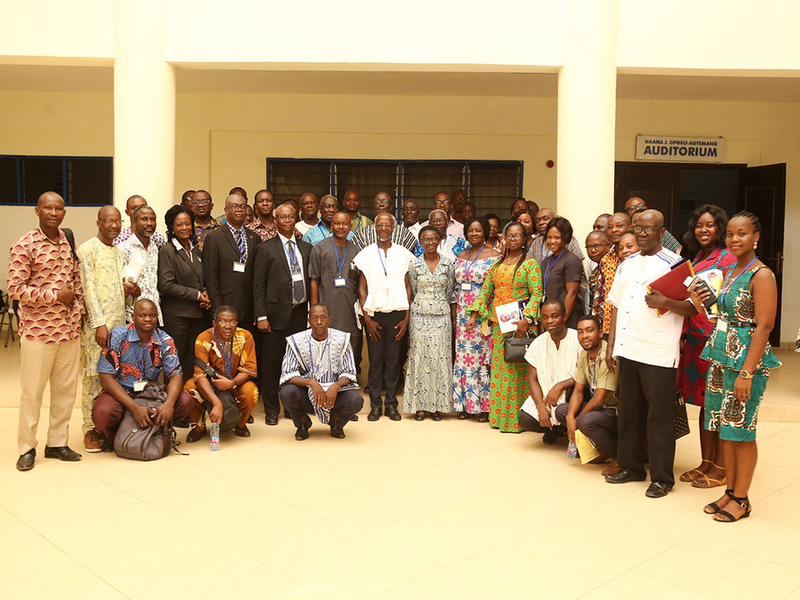 It brought together participants from Universities in Burkina Faso, Nigeria, La Côte d’Ivoire and Ghana. Recognising the significance of the Conference, the Provost of the College of Humanities and Legal Studies (CHLS), Prof. Francis Eric Amuquandoh, indicated that Prof. Britwum’s, contributions and hard work had not been in vain. “To me, this occasion is a very rare event in our part of the world to celebrate an individual who is living,” he noted. He, therefore, commended the originators of the initiative and idea to organise the conference to celebrate a senior academic. Prof. Amuquandoh congratulated Prof. Britwum on his long dedicated years of service to help transform the University to its current state through his discipline, hard work and achievements. “You did not only serve UCC but your country, Ghana by being part and a member of governmental and Institutional Boards, Committees and Councils,” he assented. To the current faculty members in active service, Prof. Amuquandoh said “the life of Prof. Britwum should motivate us to be disciplined, hardworking, and selfless in the dispensation of our responsibilities. In fact, I am very fortunate to be part of this occasion to celebrate a living academic hero - Prof. Atta Gyamfi Britwum”. In his welcome address, the Head, Department of French, Dr. Mawuloe Koffi Kodah, noted that the conference was held with the intent to recognise and celebrate the living memories of men and women of substance and stature who over the years have laboured to establish, nurture and grow the Department of French to its current development and height. “Being mindful of the desire to edify our very senior colleagues who have helped to smoothen our rough edges and turn us out as refined men and women at the service of Humanity in various capacities and positions in Ghana and beyond, we have resolved to immortalise the memories of our academic forebears in the Department through the institutionalisation of this kind of Conference in their honour in their lifetime,” he stated. According to Dr. Kodah it was more rewarding to eulogise the living legends than to hypocritically praise the dead persons believed to have really contributed immensely to the society. He further stated that the conference was geared to the noble objective to acknowledge and revere the priceless contributions of persons whose names were engraved in the golden annals of their august departments. This, he believed, would serve as a strong platform to discuss and deliberate on contemporary issues relating to Language, Literature and the Society in a fast-growing ICT advancement across the world.” He said the maiden edition of the French Conference was celebrating Prof. Atta Gyamfi Britwum, referred as “L’Oracle” (The Oracle), whose life had impacted the growth of destiny of the Department of French, his achievements and contributions to UCC, Ghana and beyond. “This because he is retired but not tired,” he said. Speaking at the opening of maiden conference, the Guest Speaker, the Vice-Chancellor Prof Joseph Ghartey Ampiah whose speech was read by the Dean, Faculty of Arts, Prof. J. B. A. Afful, expressed his joy which stemmed from the fact that the occasion defined faculty and staff as a University – the professional aspect and the human aspects. “This conference, as an academic exercise, is a platform to showcase our professional output in the form of research papers to be presented to participants with the view to expand the frontiers of knowledge and scholarship, on one hand; and to acknowledge the greatest sense of respect and gratitude, the priceless contributions of Prof. Britwum” he noted. Prof. Ampiah established that Prof. Britwum’s existence on this earth has been in the service of humanity, tilling his farm in the Department of French. Acknowledging the relevance of the Conference, the Keynote Speaker, Prof. Kwame Opoku Agyemang, thanked the Department of French for the honour bestowed on his colleague, Prof. Britwum. “This is because the issue we have had in Ghana has always been that, once you retire, you have to stay out of active service. Therefore, honouring an ordinary retired lecturer or professor is very commendable initiative and idea,” he consented. Speaking on the main theme for the conference, he indicated that the topics about Literature-Politics, Literature-Sociology, and Literature-Government have been overly given concern, but hardly would one notice that attention was being paid to the relationship between Literature-Science and Technology. He said, “Literature-Science and Technology which has now given rise to Literature and Cinema is producing the result because it is the medium which uses audio and visual elements to deliver a story. You will only need the story and the technical producers will provide the film”. Prof. Britwum said “Cinema is very important today because it helps us to see and hear directly the sounds and pictures integrated into stories and events. He added that Cinema through animation has been a film and storytelling platform for children, because inanimate objects fly, move and talk to their amusement. “Time is moving and we have to catch up with time,” he charged the participants. Prof. Agyemang commended African Writers for their good works and cautioned them not to produce unworthy literal pieces at the expense of poverty, because worthy works would pay and last. He noted that “Quality literal materials and products are very relevant, and they need to be preserved with all seriousness. We must be careful in our choice of books, and not to trade poverty to compromise on quality. We need to train ourselves at all levels of creativity to meet the modern trend in Literature,” he warned. Solidarity messages were delivered by colleagues from the foreign sister University representatives from Burkina Faso, Nigeria and La Côte d’Ivoire, as well as Ghanaian sister universities and the sponsors of the programmes.